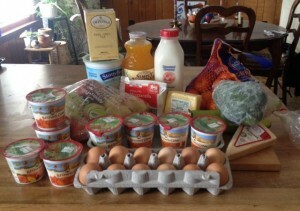 I have to say I am glad that there is only one more shopping excursion in the month of our Food Stamp Challenge. As I put the list together, looking what we have in the refrigerator and freezer (soup, pancakes, wraps), what our menu will be for the week and how I am going to prepare what needs to be prepared – the stress already builds. It is then off to the grocery stores (at least 3, but up to 4) using my calculator as I go down the aisles, looking for what is on sale and wondering if I will have enough money to buy all that is on the list. After each store I go back out to my car and subtract what was spent against my budget to see how much I still have left. I think the trip to the grocery store after next week I will through caution to the wind and buy whatever my heart and Stella’s heart desires! We are already planning our celebration dinner on March 1. Food is key part of our life and much planning goes into what we eat and purchase, but I have a whole new appreciation of the challenge of eat well on a very limited budget and feel so very fortunate that we have the means to purchase what we need to eat healthy and nutritiously and to not go to bed hungry. I still have pumpkin soup in the fridge and freezer, along with wraps – both veggie and sausage and I had enough buttermilk and oats to make another batch of soaked oats pancakes. Bread was made, but will probably make another loaf this week. Our budget was $58.09, plus I added the amount that we did not spend from last week of $3.77, giving us a total budget for the week of $61.86. Total spent was $59.54 and I did not get two items on the list, spinach and another bag of broccoli. Due to our weather our stores were pretty barren. I only have $2.32 to spend, which will not be enough, but I may just go ahead and go over since Stella will be doing school lunch again next week and she can do 2 lunches this week since she missed 2 days of school last week! 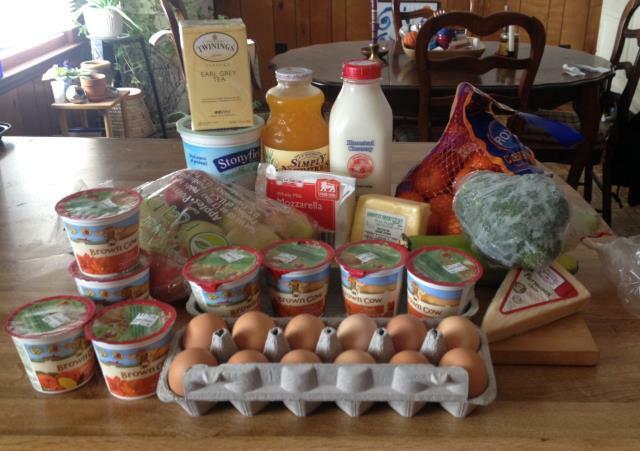 This entry was posted in Homesteading, Life and tagged food stamp challenge, groceries, shopping. Bookmark the permalink. What do people do that aren’t as organized as you are and who don’t know about nutrient dense? Maybe DSS would have you do a simple pamphlet that they could give out to folks on Food Stamps? Anyway, it is most impressive what you have been doing this month. I hope you and Stella have a blowout dinner on March !!!! A lot of work you are doing…like Candace said, maybe others can benefits from all this energy you have/are expending. As usual, I am impressed!